Usually baked goods using non-wheat flours come out more dense, but in these biscuits, using barley flour, ghee and buttermilk, they come out fluffy and light. Delicious with a little honey fresh out of the oven! In a medium bowl, combine the flour, flax, baking powder and salt. Add the ghee and work in with your fingertips until there are no more little clumps. Into a measuring cup, pour the buttermilk and beat in the egg and brown rice syrup until homogenous. Mix liquid into flour without overworking. Drop by large spoonfuls onto a lightly greased cookie sheet. Top with a sprinkling of pumpkin seeds (if using, or sprinkle with cinnamon and brown sugar, or a few fresh blueberries, whatever sounds good to you) and bake for 15-20 minutes until golden brown. 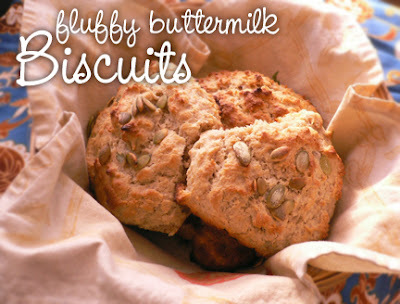 my 1st time here...these biscuits look delicious..a great compliment with tea or coffee!!! Hi Claudia,didn't know that u had one more wonderful blog....its too good and healthy too.